Oxford Scholarly Editions Online is a major publishing initiative from Oxford University Press, providing an interlinked collection of authoritative Oxford editions of major works from the humanities. Scholarly editions are the cornerstone of humanities scholarship, and Oxford University Press’s list is unparalleled in breadth and quality. Born in 1752, Frances Burney (better known as Fanny Burney) was well known as a satirical novelist in her time, anonymously publishing her first book, Evelina, in 1778. Despite her literary influence, Fanny Burney is a name unknown to many aside from the most ardent scholars. Did you know, for instance, that the title of Jane Austen’s Pride and Prejudice comes from the pages of Burney’s Cecilia? In the eighteenth century, female authors were uncommon due (in part) to social expectations for proper female behaviour. Fanny herself experienced this pressure. Although she wrote her first novel – The History of Caroline Evelyn – at the age of ten, Burney later destroyed the work in a bonfire. It is likely she did this due to the disapproval of her father. Thankfully, Burney’s tenacity (and cunning) won out in the end when she submitted the manuscript for Evelina to a publisher via her brother. The novel was a huge success, generating conversation for many months following its publication as well as receiving praise from Samuel Johnson, leaving London booksellers unable to keep up with demand. I am much obliged to You, Sir, for the great opinion You are pleased to have of me—but I should be sorry you should lose any more Time upon my account—as I have no thoughts at all of changing my situation. After he left, Fanny sat down to write the letter that she had claimed to have already sent to Barlow. Even though her father attempted to persuade her not to be too hasty in her refusal, Fanny remained true to her heart, and sent Barlow a short but firm letter refusing his proposal. 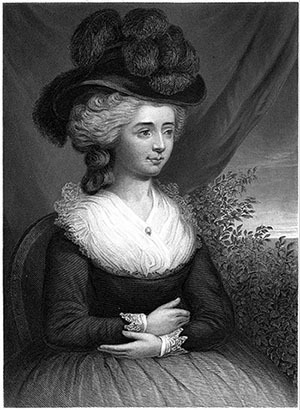 Image credit: Portrait of Madame D’Arblay (Fanny Burney) engraved from a painting by Edward Francis Burney. Public domain via Wikimedia Commons. Later in life, at the age of 41, Fanny married a man she did love: an exiled French aristocrat named Alexandre D’Arblay. Together, they had one son, and a happy marriage until Alexandre’s death in 1818. In the first place, you must not Cough. If you find a cough tickling in your throat, you must arrest it from making any sound. In the 2d. place, you must not sneeze. If you have a vehement Cold, you must take no notice of it; if your Nose-membranes feel a great invitation, you must hold your breath. In the 3d. place, you must not, upon any account, stir either hand or foot. If, by chance, a black pin runs into your Head, you must not take it out: If the pain is very great, you must be sure to bear it without wincing. In 1811, Fanny Burney was diagnosed with breast cancer. In an age before chemotherapy and the other treatments available to us today, Fanny was advised to undergo a mastectomy. Without the benefits of anaesthetics – which were also unavailable in the early 19th century – Fanny was forced to remain conscious, and in pain, for the entirety of the operation. Fanny gave a detailed account of this traumatic surgery in a letter to her sister. I bore it with all the courage I could exert, & never moved, nor stopt them, nor resisted, nor remonstrated, nor spoke. I began a scream that lasted unintermittingly during the whole time of the incision—& I almost marvel that it rings not in my Ears still! so excruciating was the agony…the evil was so profound, the case so delicate,& the precautions necessary for preventing a return so numerous, that the operation, including the treatment & the dressing, lasted 20 minutes! a time, for sufferings so acute, that was hardly supportable—However, I bore it with all the courage I could exert, & never moved, nor stopt them, nor resisted, nor remonstrated, nor spoke. Although she experienced great agony, the surgery was a success: Fanny was not pained by cancer again and outlived her younger husband, son, and her older sister, living to the age of 87. She left behind a legacy of four published novels and eight plays, along with an abundance of journals and letters which reveal intimate details from this all but forgotten author’s life. Featured image: Malvern Hall, Warwickshire (1820-21) by John Constable. Public domain via Yale Center for British Art. Nelson complained of the coldness of the saw that took his arm off – a much quicker procedure without doubt. Not many people talk about Henry Fielding (JP) and his novel Amelia about a young woman cheated of her estate by a lawyer. Stark visit to Newgate included.